Our very own truffle hunter, Franco, scours all of Italy with his 8 dogs, and networks with truffle hunters all over the peninsula. White truffles of the Crete Senesi (clay hills of Siena) vie with truffles from Alba in goodness. Each season brings a different kind of truffle: Scorzone in late winter, then bianchetto in the spring, followed by the prized Tartufo Bianco in the warmer season. We guarantee the highest quality and freshness, and if you can use what the season brings, a supply of different truffles all year round. And, if you have your own estate, or can develop events in a National Park, we can organise a truffle hunt in Britain, with Franco's trained hounds, now that the dogs can travel. Antichi Dolci di Siena - Panforte and Panpepato - 4Kg 200gr. Two versions of a medieval spice Cake, still traditionally produced in the area. In the UK we are familiar with the miniature individual versions, produced by the larger industries, while the large 4Kg. wheels have a different consistency. This small firm produces the large 'wheels' of spice cake weighing nearly 9.5 lbs!! They are chock-a-block with nuts and candied peels, and are eaten in thin slivers off the 2.5 inch rounds. They are distinguished by their combination of spicing, and a very little flour to hold the solid block of almonds, candied peels and honey together. The Panpepato is actually spiced with pepper, as well as half a dozen other spices. Makes a good, easy dessert, perhaps accompanied by a light mousse for contrast. 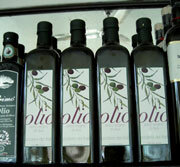 Produced according to traditional family recepies, with mostly fruit from their organic farm. These conserves/jams are slowly simmered on live fire for a long period directly after having been picked., using an astounding 250 gr. of fruit or more for each 100 gr. of jam. (high fruit content in Britain is 35-100 gr. per 100 gr. 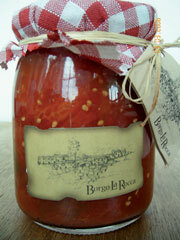 of jam) gives a concentrated flavour, and thick consistency. It is virtually boiled down fruit in proportion to 3 times its weight of fruit for each jar. Certified Organic. No added sugar 380 gr. No added sugar 780 gr. Little sugar added (10-20%) 380 gr. The Natural Coffee Company hand roasts and packs only the finest ethical coffees from some of the world's best coffee producing countries, which are either Soil Association approved, carry the Fairtrade mark or are certified by the Rainforest Alliance, or a combination of these. Coffees from around the world are selected for quality and unique flavours, maintaining their individual characteristics often lost in mass production. All coffees are open-roasted and packed to order ensuring freshness for the end user. We have selected special blends with deep, dark roasts, but coffees can be roasted to specifications. Available in packs of 250 gr. for retailers, and beans for caterers packed to specification in 500 gr. 1 Kg, or 1.5 Kg. packages. a rich full flavoured coffee with a strong aftertaste. A single estate coffee of great character and aroma. Continental blend Sumatra/Brasil espresso blend. a dark roasted blend of Colombian, Tanzanian and Santos, having a strong heavy flavour, suitable for experienced espresso drinkers. Espresso coffee is a blend of Sumatran, Costa Rica and Columbian beans carefully balanced and roasted to produce a smooth, full-bodied coffee, with no bitter aftertaste. Grown close to Lake Tawa amongst volcanic mountains, this coffee is slowly roasted to develop a rich chocolaty flavour, leaving a smooth, velvety aftertaste. …. Strong and creamy, Italian blend. Brazilian, Excelso, El Salvador, Guatemalan, Honduras, Mexican, Mysore, Nicaraguan, Papuan, Sumatran Ling Tong…. Details on request. Far East, Central American, African, Indian coffees, including Kopi Luak (Civet Cat), Blue Mountain Jamaican, Kona Hawaii, Yauco Selecto and Yemeni Matari - please ask for details on request. Ideal finish to "sweeten" the bill or accompany after-dinner coffee.